Perhaps it seems strange considering how long ago this was, but to someone who'd come up through BBSes and had spent five years watching the World Web Grow, it really felt like there wasn't anything not on the Internet at that point. While archives were considered beyond belief if they measured in the dozens of megabytes and search engines were the party of research projects and tech demos, I did feel like everything was now online and I could find it. I couldn't find my old favorite BBS (Sherwood Forest II, 914-359-1517). I couldn't find any old text files like the classics I'd considered BBS canon. In fact, I couldn't find much mention of BBSes as a subject. I didn't find lists, or software, or any sort of hint that they'd ever been around anywhere but in my own mind. It felt, to me, like they were lost, a part of history not lucky enough to be around when the Internet hit its stride, and were going to be forgotten. That was a horrible thought. At the time, registering domains that included nouns was a bit more trivial than the present day; I decided a website that would collect some of these old textfiles I'd kept on floppies all these years, from the days before The Works and post-dating the life of my own BBS. Because it was available, I registered TEXTFILES.COM. In one of those strange bits of history that hindsight would have benefitted, I also registered TEXTFILES.ORG but chose to let that one lapse, thinking it wouldn't have much purpose. I do regret that choice. TEXTFILES.COM it was, and I set to work finding my old collection of textfiles to put online. Why green? Why long file directories? Why these strange classifications, this eclectic set of categories? What's up with a blinking GIF? Good questions, all. Not all of them I can answer with definition, of course, but good questions. Green, of course, was trying to harken back to a time of green monitors and lack of color, an era I experienced via Apple II computers at my various schools and at friend's homes. The monitors that Apple used had a quality to them, a glowing and sharp green, that has always struck me as pleasant. Why I continue to think of this as a useful interface to the present day is beyond me, other than how it tells you, in one swift glance, that you are seeing something from history, a history that is limited technology compared to what you are now used to. It can predate variable-length text. It predates nearly unlimited columns on the screen. It definitely predates multi-user experiences that we now consider mundane and the realm of the majority of computer entertainment. I feel it's a signifier, and it stays. The classifications and sometimes strange filenames are the products of a twelve year old. I came up with my own classifying approach, out of my head, and that was what these files were placed under. Over time, I allowed myself to think this was more effective than it was, and by the time textfiles.com had come along, it seemed too much work to redo. So when a file's name ends in HUM (humor) or PHK (Phreak), bear in mind that a very young upstart was behind them. Advertising had not truly and completely infected the online experience, so I can't lay claim to being ahead of my time or particularly principled in regards to access to the files. I simply never liked banner ads when they were tacked onto the commercially-oriented sites and didn't have an interest in adding them to my own site. I definitely didn't think much of Google Adsense when it started providing text-based ads, even if I thought they had the potential to be less intrusive. I guess it comes down to never wanting to make use of people as nickels and dimes, instead of just letting them enjoy the place. The site itself was (and is) a mass of directories, files by the hundred, selections and descriptions written by myself over the course of months when I was in my late 20s. I began composing scripts and tools to assist me in describing them, and so I continued for a long, long time. When the site opened, the files numbered in the thousands, an amazing size for the time and all of it was right there, ready to be found. I wanted the feeling that people had when they came to my site to be the same when I logged onto a BBS at 12: a sense of wonder, of opportunity, of so much to know that I could never know it all but would instead dive into and soak in what I could. I've been given some indication over the years that for at least a few people I was successful. The website started getting attention almost immediately - people were excited to have all these old BBS artifacts so easily found online. I got interviewed in the press, was asked to speak at the DEFCON security conference, and found myself in demand as a speaker. And then, as if this wasn't enjoyable enough, people started contacting me about collections of textfiles they had been holding all these years, and that they'd like to contribute to my archive. Thus began the process of collecting at an even greater rate than I had before, and the journey I continue to this day. I've been sent stacks of disks, CD-ROMs, even entire old computer systems. I've been mailed printouts, advertisements, magazines, and hard drives. Folks who had been holding into this stuff for reasons they couldn't quite explain had finally found someone who would respect and maintain their childhoods and earlier lives. I started adding both these files (growing to tens of thousands of textfiles) and began splitting off the site into even more subjects. First web.textfiles.com (textfiles after 1995), then collections like artscene.textfiles.com and audio.textfiles.com. History wasn't just ASCII and textfiles, after all: there were so many things to save, so much to keep. The site has grown exponentially, upwards of hundreds of gigabytes. Hard drive technology is keeping ahead of it, but sometimes I wonder if it's a race to see how much I can save versus how much I can store. As many as a half-million people visit a textfiles.com site in a given month. They never meet me, may not know I'm the person behind it, may not even know why this file is where it is. They probably never used a BBS, and probably don't care. But they come to this site and they're happy to pull from it what they need at that point in their life, and I'm happy to provide it. While many might not be aware, a percentage are more than aware of the history of the BBS and they kneel at the pool of files and just lose themselves in them, clicking from memory to touchpoint to surprising new perspective. I know this because of the thousands of fan letters I've gotten; the thank yous, the questions, the testimonials to this era of the BBS. 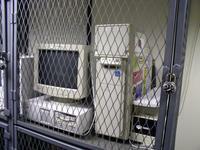 I've naturally moved between a lot of different hosting providers over the years. They include the Thomson Corporation, Dream Communications, and currently TQ Hosting. I've also kept it in my own basement when times have gotten rough, and I can assure you, they've sometimes gotten rough indeed. When 800 gigabytes of data is in one place, something on there will insult or offend somebody, somewhere, somehow. It's all part of the game, and a decade hasn't killed me or the site yet. 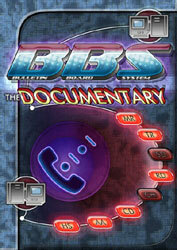 Probably the most radical change to my life was the bright idea in 2002 to capture even more of the history of the BBS by doing a documentary. The BBS Documentary was a four year project that is still paying off, between friends made, things learned, and history saved. Hundreds of people were interviewed and hundreds of hours filmed for it, and the resulting work has been downloaded or bought by thousands. How could I have known how much would come of putting up my collection of textfiles back in 1998? It has been a great life, so far.